Buying a garage dehumidifier costs money but cars cost a lot more, and they are made largely from steel, so they can suffer from corrosion. If you have lived in your home for many years and have a small mortgage, or none at all, your car can actually cost more per month than your house. If this seems absurd just think of how much less your car is worth when you sell it, compared with when you bought it. Of course the economics are not really that simple but we won't go into that here. We all know, however, that the cost of your pride and joy is a lot more than just the price of gas. If we own a car to get to work, to get to the mall, for weekend trips, to take the kids to school and so on we want to keep those costs down. If you are a classic car enthusiast and are lucky enough to own one you almost certainly store it in a garage. Whether you have spent thousands on a professionally restored car or invested hundreds of hours doing your own restoration you have a valuable and treasured asset you now wish to protect. 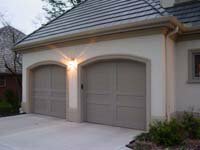 If you have a garage large enough to hold your car there is no better place to protect it from the ravages of the weather. Unfortunately, unless the relative humidity in the garage is maintained at 60% or less the metal will corrode. Just to complicate matters the relative humidity needs to remain above 40% or wood and leather will dry out too much and cracking and other damage can result. This may be of particular concern to owners of some classic models. Heating the garage can help. Relative humidity is a measure of the amount of water in the air relative to the amount it can hold at any given temperature. The warmer the air the more water it can hold. It follows that raising the temperature lowers the relative humidity even though it does not reduce the absolute amount of water in the air. The benefit is that raising the relative humidity lowers the risk of condensation, which causes corrosion. Heating the garage is relatively expensive. Ventilation can help but only if the relative humidity outside the garage is lower than 60% since ventilation only replaces internal air with air from outside. If the car is wet with rain it is advisable to leave the garage doors open until the excess water has dried off but the main objective is to keep RH inside the garage in the "sweet spot" between 40% and 60% while the car is locked away. If you wish to measure the relative humidity you should use a measuring device called a hygrometer. To control the relative humidity the surest method is to use a Garage Dehumidifier. Before investing in a Garage Dehumidifier you need to check out a few things. First, does it have an adjustable humidistat? A humidistat works like a thermostat. A thermostat turns off your heating when the target temperature is reached and restarts it when the temperature falls below the level you have set. Similarly a humidistat turns off your dehumidifier when the relative humidity falls below the preset level and restarts it when the relative humidity rises above that level. This saves money and ensures that the relative humidity does not fall to a level where wood and leather may be damaged. Second, will your garage dehumidifier continue to be effective at lower temperatures, typical of those in a garage in regions with colder winters? If your Garage Dehumidifier operates using the refrigerant process it will not usually operate effectively below 16°C (60°F). The machine you need must have "hot gas defrost" to overcome this problem. With this refinement the appliance should work at any temperature down to just above the freezing point of water. Almost all dehumidifiers have a defrost mode, usually called "auto-defrost" but not all have hot gas defrost. Auto defrost detects when ice has formed on the evaporator coil. It switches off the compressor, the heart of the refrigeration system, so dehumidification stops. The fan keeps running and the flow of ambient air melts the ice. When it has melted the compressor restarts. It is obvious that the lower the ambient temperature the more quickly ice will form. It is also obvious that the cooler the air the longer it will take to melt the ice. Therefore, the lower the ambient temperature the more frequently the dehumidifier switches to defrost mode and the longer each defrost cycle will take. Ergo the cooler the air the less time the dehumidifier is dehumidifying. This is why a dehumidifier which relies on auto defrost becomes largely ineffective at temperatures below 16°C. When it says on the specification that the dehumidifier can operate at temperatures down to 5°C it means only that the dehumidifier will not be damaged. It does not mean it will be effective. Hot gas defrost works in the same way except that when the compressor stops a flow of heated air is blown over the evaporator coil which quickly melts the ice. This system allows such dehumidifiers to operate effectively at temperatures as low as 1°C, a genuine low temperature dehumidifier. Very few home dehumidifiers have this feature. One of the few that does, and the one we recommend, is the Mitsubishi MJ-E16V. An alternative is to buy a desiccant dehumidifier, which uses the water absorbing properties of a desiccant material. Air passes over a rotor that is coated with the desiccant. This absorbs moisture which is removed by warm air blown across the rotor. Industrial models vent the warm, moist air through a duct to the outside of the building, much the same way as with a clothes dryer. Desiccant dehumidifiers for home use collect the water in a bucket, in the same way as a refrigerant dehumidifier. This type of garage dehumidifier will operate effectively at any temperature down to 1°C. It will not operate in temperatures at or below freezing point however. In a really harsh winter a modest amount of heating may be required on the coldest nights to keep the garage temperature a degree or two above freezing point. While highly effective at removing moisture, particularly at lower temperatures, this type of Garage Dehumidifier does use more electricity than the refrigerant type but it is a genuinely low temperature dehumidifier. Third, is your dehumidifier powerful enough? By power we mean the amount of water it can remove in a given period of time. Dehumidifier manufacturers will include this information in their product descriptions and give an indication of the floor area, or cubic area of the air-space, in which a given model will control the relative humidity. For refrigerant dehumidifiers these figures will apply only at the temperature and relative humidity specified. At lower temperature and relative humidity less water will be extracted. While you will not want an appliance that is more costly to run than you need it may be wise to buy one size bigger to be safe; a little like buying your winter boots one size bigger than your shoe size to allow for a second pair of thick woollen socks. A desiccant dehumidifier's performance is affected less by temperature so this issue is less significant for this type and the "one size bigger" principle does not apply with equal force. One point worth making is that the rechargeable mini-dehumidifier that may be suitable for the inside of the car will not be powerful enough for the garage. While it's pretty certain that most of you know how to calculate the cubic area of your garage for any who don't it's quite simple. Measure the width of the floor and its length. Multiply these two numbers and you have the floor area. Measure the height from floor to ceiling and multiply that number by the floor area. The number you now have is the volume in cubic feet or cubic meters, depending on the unit of measurement on your tape measure. Fourth, does your dehumidifier have a continuous drainage capability? Most dehumidifiers have a fairly small bucket inside to collect the water. When it's full they switch off automatically. Continuous drain just means that the dehumidifier has a hose which you can attach to the unit and run to a drain or sink to allow the water to flow away safely. If your classic is in a rented garage you don't get to every day, or you are going on vacation, this is a real necessity. Finally, if you are away for periods of more than a day or two an automatic restart is essential. The purpose of this is to restart your garage dehumidifier following any interruption in your electricity supply. To conclude then, if you can't put your car in a garage a mini dehumidifier relying on silica gel crystals is best for you. If you do have use of a garage your garage dehumidifier is your car dehumidifier too. Leave the windows open while in the garage and it will work on the interior as well. It will also preserve your tools and other items stored in the garage.